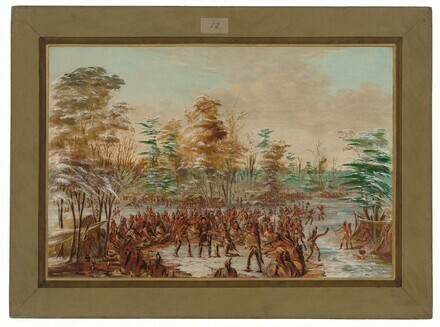 THE CHEVALIER DE TONTY suing for peace in the village of the Iroquois, 2d Jan. 1680.
lower left: G. Catlin p.
26 paintings by George Catlin from the Paul Mellon Collection, Old Courthouse, Jefferson National Expansion Memorial (National Park Service, U.S. Department of the Interior), St. Louis, Missouri, 1965-1968, no. 11, repro. Voyages of Discovery by La Salle, St. Paul Art Center, Minnesota, 1968. Westward the Artist [Third Anniversary Exhibition], Lakeview Center for the Arts and Sciences, Peoria, Illinois, 1968, no. 33. [The La Salle Series], Amon Carter Museum of Western Art, Fort Worth, 1970. An Exhibition of Paintings and Lithographs by George Catlin, Artist Historian, Tennessee Fine Arts Center, Nashville, 1971, no. 46. Voyages of Discovery by La Salle, Northern Virginia Fine Arts Association, Alexandria, 1972. [Catlin exhibition], Art Museum of South Texas, Corpus Christi, 1973. Voyages of Discovery by La Salle, Phoenix Art Museum, 1973-1974. Voyages of Discovery by La Salle, Missouri Historical Society, St. Louis, 1977. Inaugural Exhibition, The Community Art Gallery, Santa Fe Community College, Gainesville, Florida, 1978. American Indian Life: Paintings by George Catlin, National Gallery of Art, Washington, D.C., 1980. George Catlin: The Indian Gallery & The Voyages of La Salle, The Mansfield Art Center, Ohio, 1980, no. 62. Two Hundred Years of American Paintings, 1700-1900, Inaugural Exhibition, The Museum of Arts and Sciences, Macon, Georgia, 1981, no. 15 (and listed separately pp. 69-72). George Catlin: An American View, Albright-Knox Art Gallery, Buffalo, 1988. Voyages of Discovery: History Paintings by George Catlin (NGA National Lending Service exhibition), Live Oak Gardens Foundation, Inc. [now Rip Van Winkle Gardens on Jefferson Island], New Iberia, Louisiana, 1992. Voyages of Discovery: History Paintings by George Catlin (NGA National Lending Service exhibition), The Lowe Art Museum, Coral Gables, Florida, 1993. American Paintings and Sculpture: An Illustrated Catalogue. National Gallery of Art, Washington, 1970: 37. American Paintings: An Illustrated Catalogue. National Gallery of Art, Washington, 1980: 56, repro. American Paintings: An Illustrated Catalogue. National Gallery of Art, Washington, 1992: 132, repro.